As we wrap up our look into the jewelry collection of our Magpie of the Month, Crown Princess Victoria of Sweden, I've saved one of the best for last. 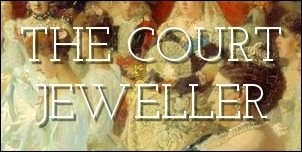 One of my favorite pieces from the entire Bernadotte jewel cache is today's necklace, the Processional Jewels. In Swedish, this necklace is called intågssmycket, or "processional jewelry." The piece's unusual name is linked to its original purpose: as a gift for a brand new Swedish crown princess, to celebrate her arrival in her new country. The recipient of this astonishing necklace, which is made of gold, diamonds, pearls, and Ceylon sapphires, was Victoria of Baden. She was the daughter of Friedrich I, the Grand Duke of Baden, and Princess Louise of Prussia (who was a sister-in-law of Princess Vicky, the eldest child of Queen Victoria and Prince Albert). But although she was a thoroughly German princess, Victoria of Baden also had Swedish roots. Her paternal grandmother was born Princess Sophie of Sweden, a daughter of King Gustaf IV Adolf of Sweden. When Victoria married Crown Prince Gustaf of Sweden in 1881, the Swedish people were thrilled about her links to the old Swedish royal dynasty, proclaiming her "the Vasa princess." Sweden's new princess -- and future queen -- needed a special piece of jewelry to welcome her into her new home country. After Gustaf and Victoria were married in Germany, she was given the intågssmycket to wear on her procession into Stockholm. Since then, the necklace has been an important part of the Bernadotte jewel collection. It's been worn by both of the subsequent queens of Sweden, Louise and Silvia. But the necklace isn't just reserved for queens. The piece has also been worn by Swedish princesses, including Princess Christina, Princess Lilian, and Princess Madeleine, who memorably donned the necklace at her sister's wedding in 2010, pairing it with the Connaught Diamond Tiara. Crown Princess Victoria has also worn her namesake's necklace. Above, she pairs it with another of Victoria of Baden's jewels, the Baden Fringe Tiara, at the Nobel Prize ceremony in 2005.